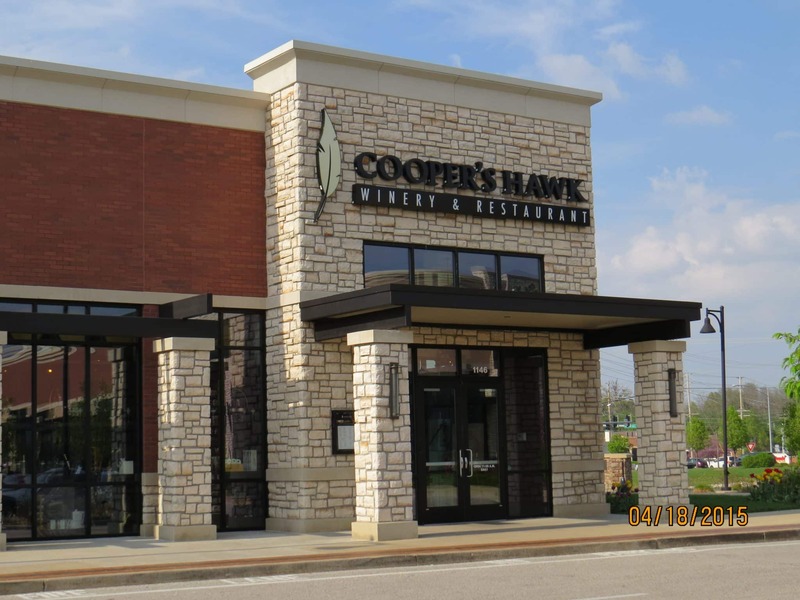 Cooper’s Hawk Winery – Tim and Danna McEnery opened their first restaurant in 2005 in Overland Park, IL. It was the first Illinois concept restaurant and winery under one roof. McEnery wanted to create a concept of tomorrow for guests to enjoy today. He wanted to create an innovative dining experience that had much to do with wine appreciation than solely food. However, our opinion is that they succeeded at both. Obviously, it was a great vision since they have added 18 more since then with four additional establishments planned through 2015 according to their website. While our review is dedicated to the Cooper’s Hawk Winery located at 1146 Town and Country Crossing Drive, Town and Country, MO, we have no doubt that all locations are managed using the same high quality values. While it is not locally owned, it is a Midwest based chain. McEnery has been in the restaurant business learning the various aspects since he was 11 years old, working as a dishwasher and working his way up, even working at country club’s and wineries to learn those businesses. He received his bachelor’s degree in; you guessed it, Restaurant and Hotel Management from Purdue University. All along he was creating his business plan that appears to have turned out to be his “master piece.” Cooper’s Hawk Winery offers a modern but casual atmosphere with a menu of dishes created with their handcrafted wines in mind. Each menu item is paired with the idyllic wine. If you have never been to a first class winery this is a great substitute. If you have been to some of the finer Napa Valley wineries and can’t afford to visit them on a weekly basis since we live in Missouri, consider visiting Cooper’s Hawk Winery in Town and Country, MO or The Plaza, Kansas City, MO. Since opening they have received more than 300 wine awards from various regional, national and international competitions. Their success is understandable. They have successfully created a distinctive atmosphere that replicates and possibly exceeds the finest wineries in the country. The vision of combining a restaurant and winery is not necessarily unique, but in Town and Country, MO it is. Outside of their quality wines and cuisines, their locations are a major key. There are a few Missouri wineries that have attempted to create a unique attraction, but most are not conveniently located and the food does not meet the standards created at Cooper’s Hawk Winery. They produce almost 60 wines, totaling approximately 240,000 cases, making them the fifth largest winery outside California with sales exceeding more than 120 million in 2014. Impressive! The offer specialties like Sangria, Cooper’s Hawk Bellini, Champagne Cocktail and Cooper’s Hawk Mimosa. They offer Large Formats including Magnum, Double Magnum, Imperial and Salmanazar. My favorite is their Winemaker’s Barrel Reserve, handcrafted blend straight from the barrel for $8.75 per glass. That’s a great touch of class. Naturally, they offer a full service bar. Appetizers – eleven ranging in price from $8.99 to $21.49, which includes sampler platter, crab cakes, chicken pot stickers, Ahi Tuna Tacos and more. Wide variety! Chef Matt’s Cheese Tasting – Artisan cheeses for the novice as well as the cheese enthusiast and you can pair it with Wine Pairing Flight. Great idea! Additionally, they have a Life Balanced menu with appetizers, chopped salads, burgers, seafood and dessert. To top it off, they have house made desserts. Their menu has a wide variety of cuisines creating something for every taste and most budgets. From my experience at their Town and Country location and Kansas City location they have truly created a unique ambiance, complimented by award winnings wines and distinctively tasteful cuisines that few, if any can rival. Additionally, they offer a wine tasting room, a wine club; private parties and what is most impressive are wine trips. For example; September 17 – 20, 2015 McEnery is hosting a Wine Tour to Santa Barbara, CA. As McEnery’s guest you will explore the majestic mountain views, historic vineyards and quaint lifestyle of the famed region of Santa Barbara, CA. Menus and prices may vary among their various locations. The menu we have is approximately six months old. We recommend that you visit their website and online store at www.coopershawkwinery.com. They sell wines, gift sets, wine accessories, gourmet foods, gift cards and another clever idea, custom white labels. It’s an inspiring online store. Many of the items can be purchased at one of their locations. An item that we find interesting is the Rojaus Grapevine Decanter. They have certainly helped popularize those decanters. Their Facebook has had more than 472,000 visitors with more than 67,000 likes. Yelp gives them a 3.5 Star rating. We don’t understand or agree with that rating. However, Urbanspoon gives them an 87%. St Louis Restaurant Review gives Cooper’s Hawk Winery a 4.50 Star Rating. We recommend that you visit a location nearest to you. We offer our congratulations to Mr. and Mrs. McEnery on their exceptional and flourishing vision. We wish them luck and continued growth. This review is unbiased and no affiliation currently exists between Cooper’s Hawk Winery and WebTech Group, publishers of St Louis Restaurant Review. This review is unbiased and is solely our opinion. This is not paid advertisement. Cooper’s Hawk Winery is now on our watch list. We will provide updates as they become available.